Donkey Kong Country 2 turns twenty years old this month (the original DKC has its twenty-first anniversary as well). As part of my celebration of all things DKC to commemorate this milestone year for the series, here is a top five list of the best “Animal Buddies” who have appeared in the series! The Animal Buddies, as any DKC fan knows, are the ridable (and sometimes unridable) animals that aid DK, Diddy, and their simian friends on their adventures by providing their own sets of abilities into the mix. Think Yoshi, but with Donkey Kong instead. The following top five are ranked from least to greatest based on their presence in the series, their general usefulness, what they bring to the gameplay, and simply how awesome they are. 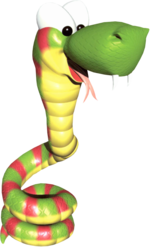 Let’s be honest, Rattly the Rattlesnake was really just a replacement for Winky the Frog from the first Donkey Kong Country, as both not only share similar color schemes, but provide basically the same function of superior jumping ability. But Rattly gets the edge over his predecessor for having the ability to use a “super jump” move that allows him to jump higher than Winky ever could, as well as having an entire level where you get to play as him. Not to mention a snake that jumps like a spring is a bit more original than a jumping frog. Just sayin’. Besides, have you ever seen a snake that cute before? Not likely. Behold, the renaissance man (err…parrot) of the Donkey Kong series. The only animal buddy to appear in all five games under the Donkey Kong Country label. He even had small roles in games like Donkey Kong 64! Squawks has also proven to be a more versatile ally than his fellow Animal Buddies: In the first DKC he simply carried a flashlight in a dark cave level. In DKCs 2 and 3 he grew big enough to carry Diddy, Dixie and Kiddy Kong with his talons (that’s one big parrot!) to fly over danger and spit coconuts at enemies. In the modern sequels on the Wii and Wii U, Squawks has taken a less active (but still very useful) role of helping DK find the hidden puzzle pieces in each level. You’ve got to love a parrot with this kind of resume. Just don’t confuse him with his purple counterpart Quawks, who is so out of shape he can only descend when holding the monkeys instead of fly, and can’t even spit coconuts at enemies. 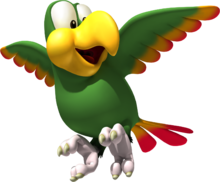 Enguarde was the only Animal Buddy to be playable in all three games of the original DKC trilogy on the SNES, which gives him a special place in the series. It’s just a shame he didn’t make a comeback in DKCR or Tropical Freeze (especially since the latter brought back water levels). 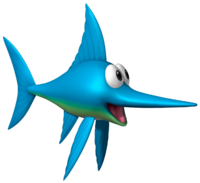 Seeing as Enguarde only appears in water levels for obvious reasons, he may not show up too frequently, but his sharp nose and agile swimming make the water levels that much more fun. Having trouble getting passed some troublesome sharks? Just hop on Enguarde and make sushi out of them! He’s almost like hitting an easy button on the water stages. In the sequels, Enguarde even learned a charge attack that could send him swimming at great speed. Perfect for finding secret bonus rooms and taking out waves of enemies. 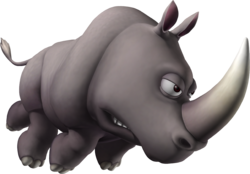 Rambi the Rhino is the Animal Buddy, at least as far as iconic status goes. He’s the most synonymous Animal Buddy in the series, appearing in the first two DKCs and being the only Animal Buddy (other than the non-playable Squawks) to make a comeback in the newer DKC sequels (he was replaced in DKC3 by Ellie the Elephant, who was cute but kind of just recycled Rambi’s abilities). Rambi will turn even the toughest bad guys into easy pickings, as his horn can take out any foe with ease. Like Enguarde, he even gained a charging attack in the sequel, which made him all the more devastating. He’s DK’s most loyal Animal Buddy, being akin to the great ape’s pet (he even pants like a dog, which is adorable). But to all of DK’s enemies, he’s a weapon of mass destruction. There’s no Animal Buddy quite as awesome as Squitter the Spider. He resembles molten rock, and has sweet sneakers on all eight of his feet. That alone would put him pretty high on this list, but what makes him take the cake is how useful his abilities are. Squitter may not be able to perform charge attacks, but he has something even better: Two different web-based moves! One shoots balled-up webs like bullets, and can take out bad guys from a great distance. The other one shoots webs that can be turned into web platforms at the press of a button, which adds a whole new dimension to the platforming gameplay (Mario himself wouldn’t get a similar ability until Super Mario Galaxy 2 fifteen years later, with the addition of the Cloud Suit). Do I even need to mention how cool it is that a couple of monkeys ride on top of a spider? Usually, spiders are bad guys in video games, but Squitter is all about breaking stereotypes, and is the most useful ally the Kongs have. Similar to Rattly, he gets an entire level dedicated to him in DKC2. He even gets a level dedicated to him in DKC3! It’s just a shame he has yet to make a comeback in the series. Essentially, Squitter has it all. He looks cool, his abilities couldn’t be more useful, he adds innovative ideas to the gameplay, and did I mention he’s a sneaker-wearing spider? Easily the best Animal Buddy. When I was younger, Squitter’s levels made me shudder because I had major trouble juggling its two moves, which often had to be alternated or used simultaneously to clear the hardest obstacles with efficiency, but nowadays I feel great when Squitter shows up. He deserves the top spot for sure. You have put together a great list and I think my Top 5 would be the same, albeit in a slightly different. I think Squitter’s levels are among the most unique in the game. During my most recent playthrough, I gained a new appreciation for Web Woods, as it really hit me that the level is more or less one huge, bottomless pit after another, meaning the majority of platforms are the ones Squitter creates. Brilliant. Who is the greatest steed?